If you friend me, you should tell me who you are here. This blog site's mobile version doesn't work, and the non-mobile version takes too much bandwidth, so look for me on identi.ca or irc. Last of the talks today. Afterwards there was football and volleyball. Lesson: sign up for things ahead of time if you want to get a t-shirt. They didn't have enough made from the morning's count. There were lots of people at volleyball. I met bug triager gkiagia, and the kivo guy who was here all the way from China. There were a bunch more, some of whom were really good volleyball players, but I'm pretty bad with names... You're all great anyway! Especially the folk that hadn't played for a long time, or had never played and were still willing to play! Hope your bruises aren't too bad. The network has been very sad, I finally switched to 3G to be able to post to identi.ca. I wish people were better at using the offical conference tag (wasn't it #ds2011?) on all their posts, but I guess it hasn't been announced as widely as it could be. As a result, to get all the posts I have to search on #desktopsummit, #ds2011, etc. On twitter and identica. Over flaky network. Nokia & Qt? Don't panic. There are some really shrill voices out there of people predicting doomsday or saying how quickly they will leave to some other non-Qt toolkit. Honestly people! Take a Valium and come back on Monday, once we get more details. This was big and secret from everyone, it will take time for Nokia groups to get details. It is very silly to be calling for a Qt fork at this point. Incidentally, I got up at 5am and watched both parts of the screencast, and they seemed pretty cagey about Qt and MeeGo. One slide came with two disclaimers: "not including MeeGo devices" and "not actual numbers". Not quite that wording, but you get the idea. 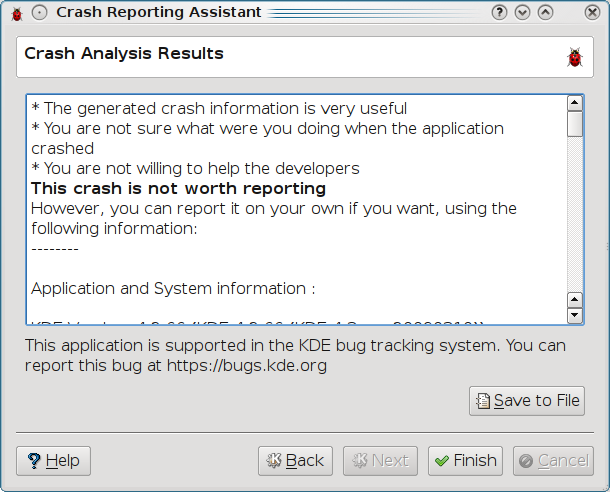 I'll leave it to others to say why KDE should be unconcerned at this point. Plus a big thank-you to Lydia Pintscher for running KDE's Code-in! I should also thank my employer, froglogic.com for being understanding during my Heathrow adventure. We're probably still hiring, btw. ;) Hamburg is a great city, and if you're a sales engineer, we're looking for someone in the USA. My name is Samuel Brack and I'm a 18-year-old student from Germany. I participated in the Google Code In contest and here's my summary of what I've done. It all started in November with a blog post in Nightrose's blog mentioning a contest where you get mentored by KDE people and do some useful work. Additionally you receive a T-shirt and some money if you participate. Since I wanted to collaborate in KDE for a long time but never took the steps to find for a task myself, Google Code In was the right place. So, I set up an account and started working. Today I've done 11 tasks for KDE and one for the operating system Haiku. Unfortunately, my coding experience is not high enough that I can produce good code, so I decided to do only tasks where I didn't have to program. My first choice was writing a tutorial for using Jabber in Kopete. That was quite a lot of work but I learned some features I didn't really know in Kopete (even though I use it daily) and was proud to have contributed in the KDE community for the first time. Thanks to my mentor Anne for helping me with this. Following up on that, I found a quite small task – writing an article for the Amarok Insider about the project „Amarok LiveCD“. After having installed it and playing around a bit in a virtual machine, I wrote this article. Thanks to Valorie for mentoring me in this case. The last eight tasks I did in KDE were all of the same kind. 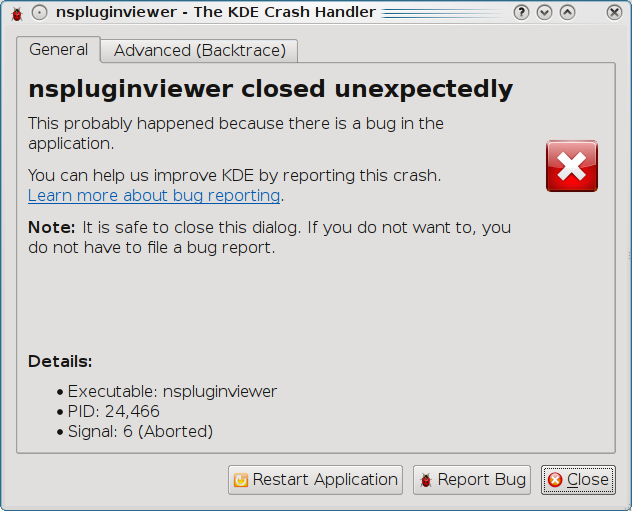 My work was to clean up some bugs either in the Konqueror or in the KDE area of the bugzilla. I went through 160 bugs in these days and could close some of them (thanks for the permission to edit bugs), too. I now know Konqueror and especially khtml much better than before and am able to sort and test bug reports, which is actually useful in the KDE community. Thanks to Alex in these tasks. All in all, I can say that the GCI helped me to join the active KDE community and it showed me how things are organized within the project. Thanks especially to my mentors and to Nightrose, who coordinated all that stuff on the IRC channel. Things that could be done a bit better in future contests are mainly the Google Melange website, that's quite slow and querying the task database needs very much time. The rest was very fine and I'm looking forward to participate in GSoC one time perhaps, since this is my last year in school. Konqueror screencast: Code-in student submissions! Konqueror's students were some of the first ones done with tasks! Thanks to Snizzo for the screencast! You've had lots of compliments on irc. The other task results will get added to the website (http://konqueror.kde.org) and where promo people can find them. If you are interested in one of the current tasks, feel free to join #khtml and ask questions. There are more screenshot and screencast tasks! Looking for a good way to contribute and got some spare time this weekend? KDE BugSquad is holding a Bug Day revival this Sunday 1st of August and still looking for people who'd like to help out with getting Dolphin bugs under control. We'll be gathering in our IRC channel (#kde-bugs) starting around 10:00 AM european time zone. As always, no coding skills required. All you need is a recent version of our beloved KDE Software Compilation. Senior bug triagers will be around to help you get started. Can't make it then? That's ok, we'll have another. Promise. But feel free to drop by anytime, bug reports always come in, and somebody has to look at all those duplicates! Then the big question: do we hold our Bof in the back of a bus next year too? It makes it hard to take a group photo! 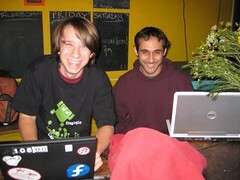 First froglogic CampKDE t-shirt sighting! If you don't have one yet, come find me. I think I've given out most of today's batch, but I'll have more tommorrow. Now we need to make our own shirts like that! Incidentally, if you were wondering why facebook suddenly broke, i.e. started sending you to the mobile version, well, currently if you use the default UA string, it 302s you to the mobile version. For me this bites, because a few of those apps don't work in Firefox on linux. EDIT: I posted this when planet broke, so I'm bumping the date to hit the feed. I guess it's stale now, but oh well. Woke up to find the Phonon BugDay is going well. They're halfway through, but could still use some help with the second half! Also needed: someone with an external usb sound device and someone using KDE on MS-Windows. Join in, #kde-bugs on irc.freenode.net! Hot day, bad day. No cat. But new hackergotchi! Nepomuk? I've put off blogging for a while, but I've been meaning to do a series of posts on social media/networking/desktop/soldering irons (hey, everything is "social" now). It was way too hot to post today, as least by the metric of "hmm, I've drunk half of the lemonade for the week while walking home from the farmer's market, and I'm still thirsty." But it's night now, so you'd think it would be better, except my wifi is messed up, and I had to sit on a chair, and I hate chairs. I was also catsitting my old cat. :( He's ended up with a bad tail injury. I'm a little flipped out on that. So I think you get to wait on the "social" posts. Sorry. I'll sleep, and then declare it a new day when I wake up. It'll have to be better then. I'd like to thank Marijn Kruisselbrink (Mek) for my new hackergotchi photo. Thanks also to Fredrik Holgrund (fredrikh) for post-processing. Check out that drop shadow, woot. Now you can see that, yes, despite the gender neutral "Alex" you can call me by, the "A.L." I'm formally listed as on most everywhere, and the mysterious "blauzahl", I really am female. I wonder how much online harassment that has actually saved me over the years? I've gotten surprisingly little, really. Or I just expected so much worse based on stories, that what I did get seemed fine. One reason I've put off posting is that I haven't updated trunk for quite a while... Since before GCDS! I got tired of breaking things the night before a talk/con/travel/etc (they never break otherwise! ), so just didn't update. And I'm not sure how many conferences I went to right after that. I think two. And then I started my new job, which probably should get it's own entry when I'm more chipper. The important part is: I don't know what apps use nepomuk now, and who has added capabilities for it. I was stunned when I did an svn up and saw what gwenview last had. So please tell me if your app does more with it than before GCDS. :) I thought I heard that digiKam was using it now. So we'd get back late at night, and dani_l would look at me as I'd pull out my laptop, and say, "You're going to blog? At this hour?" And yeah, I did. I think consistently, even. Well, here is a post from the auto-save of my blogging software. Yesterday was the last day of GCDS at the university for me. I dragged myself out of early to go and do DrKonqi stuff in the morning. Lunch was more "food". Then back to do more DrKonqi. Oh no, the paintball trip... Where we were supposed to leave from the Auditorium which we were no longer meeting at, nor were we anywhere near. So an interesting calling around began to see what was going on. Most people on the list seemed to have canceled from being too tired. Quite understandable at this point, really. Anyway, the locals finally found the name and location of the place and called us a taxi. Four of us took a rather scenic taxi. Er, well, yeah. The guy couldn't find the place, and so we drove around in circles on gravel roads and got to see ruins of houses built into cliffs and some nice rocks. (They're very good at using basalt here as accents in buildings, btw.) He didn't understand where we were going, and nobody seemed to be able to give him good directions. Anyway, we ended up getting off back at the Auditorium and had people come pick us up. By the time I left, 2am and 4am were normal "evening times" for me. There is nothing like night on a beach... And then watching the sunrise. There was either/both a full moon or strong light pollution: even though it was dark, you could see the whites of the breakers as they crashed. It was an entirely new pattern/way to watch an ocean. And beautiful. Suggestion for next year: Nokia-sponsored beanbags in the hacking room. Or bring the Google ones over. [&&] They can even be non-virtual! Drkonqi discussion. Now. 3-1. Till we get bored or hungry. p.s. for some reason syndication decided to take my "music" tag and make that the subject line of my last post. bah. 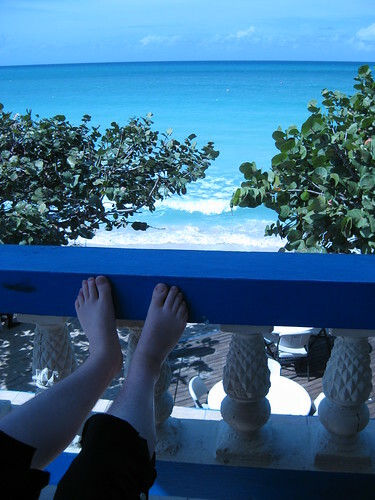 For the first day here, I was able to sleep in till the grand hour of 10am. This was incredibly luxurious, although I could certainly have used more. Nobody from our place was involved in Plasma or KWin so we could skip that bof. :) We left in time to make sure we caught the bus for the trip, and ended up being early enough for me to catch the Community bof. There we discussed having party packs to give to people who were having parties to promote kde, and how exactly that might work. We get up bright and early tomorrow: I expect we'll do some DrKonqi work where we can find a whiteboard and a somewhat unobtrusive spot. Amazingly enough, Dario has been working on keeping up with bugs while here. Otoh, he's also been sick at home lots, and is coughing up a storm these days. Hopefully he'll be well enough tomorrow. Signing off, shower and rumor has it there is food in the Penthouse... At least, they have my gluten-free pasta and just came to take our forks. Is what I was asked by someone after a recent meal. The answer is, no, I didn't really enjoy it, but in terms of eating out, so far it was one of the better things I've had that I didn't have cooked in one of our kitchens. The meal? One of the "salads". In this case, tuna in the center, with some tomato, cucumber, something else, and shredded egg on top. I should post a picture, they look really goofy. And not like salads at all. I have celiac disease, so I avoid grain products pretty strictly [#]. I'm going to hit the bottom of my energy bar supply after our little field trip tomorrow. So I'm going to start needing to either figure out how to pack a lunch here, decide that the plain almonds I have left are tasty, or get used to paying 6.50 euros for a bizarre salad. p.s. Yes, I will admit that the water tastes kind of bad. I wonder if it is more energy-intensive to import bottled water, or to desalinate the water here. Both are pretty bad. [#] Note that I'm also allergic to milk (yes, allergic; I thought I could just eat lots of manachego while here, but the first time I had some it turned out to be too milky. Opps. My ears are still messed up. Better not be sinus infection.) and I'm quasi-vegetarian. Quasi. Tonight was the Collabora party. As the evening wore on, the early trend of swapping nametags rapidly picked up. It became a game to see just whose you could get. I'm not sure who has mine right now. But I have ereslibre's, which is neat, because I didn't realize he was here, and I wouldn't have met him otherwise. Which is the downside to this conference: it is rather large. If you don't know who you are looking for, you might not necessarily run into them. All the same, I did run into and manage to talk to Sumana for a bit, which was pretty cool, as I haven't seen her since she moved out to NYC. GCDS: Random notes on how to build QtWebKit from Simon "bof"
6) mark attachment for review with r? Last night's amusement was doing laundry. The amusement part comes in with us attempting to read the washing machine (including one native spanish speaker, but there weren't exactly instructions; you could pick centrifugal amount!). I picked one of the three or four options for 40 degrees Celsius. That was last night. I went to go pick it up this morning, and found it was STILL going. That's some wash. And I'm not actually sure *what*. Hopefully my laundry is still good! No clue where we're supposed to go for lunch exactly. But I'm wired. And just from writing this amount my wrists hurt.... OUCH. Hope the floor is cleanish. :P It looks very hard tho. Maybe the table is softer to sit on? At any rate, I'm wired, done writing. Time to work. Ping Dario or I on irc if you're interested in the drkonqi hacking session, especially since I don't know who is interested... Or when/where we'll meet. It will probably be later in the week, actually. [%] For moving to the floor, I should have brought our lovely sponsor-provided Qt Software towel. I would have been stylish at least. Except, it's still in the laundry. Oh well, I guess Douglas Adams was right! More from GC: eV meeting & "the web problem"
* Aftershave doesn't make for good shampoo. Opps. * People are happy to trade ice cream tickets for coffee tickets. * SVN konvi doesn't scroll right. I cry. Also apologies for disconnecting every two seconds. Isn't this a first world country? I shouldn't catch anything from it, right? Am I wrong? Are all the pipes lead? I can't tell why exactly it isn't "safe to drink". I've had one person say it was chlorine in the water. But apparently plastic in the water leeched from plastic water bottles is safe to drink. I don't mind chlorine, I like my water dead. This has resulted in me not getting enough water... (One place refused to serve tap water; I had to spend 2 euro for a tiny tiny bottle) So I've been getting mostly bottled distilled water: zero salts at all. Little food, none of it containing salt... I went and bought a thing of salt and salted some water to make a rehydration drink. Water started being appealing again. Looks like I'll be drinking salted water from now on. Glad I brought my water bottle. * Work! I gave two lightening talks. The first was one about DrKonqi that Dario and I put together. The second was on BugSquad in general. * Collaborate! One of the Gnome bugsquad-equivalent people is now interested in us and will track me down. I'll note that BugSquad has a bof on one of the bof days. We'll do some planning and have a group photo. Everybody is welcome to come: you can drop by and say how much you love us or how much you hate us. If you want to drop by and say how we can effectively triage your bugs, that would be great, I'm happy to write up some kind of supplemental documentation to our stuff. * Photos. Of course I have photos. Maybe they'll get posted someday. Especially the "tall guys" one. * Qt gave us all green towels. Way cool and useful. * Dfaure said he liked seeing new faces... Perhaps those of you who didn't want to ask the eV for travel help should do it next year. ;) Make David happy. * My hotel has Bugsquad, KDAB, and Kubuntu people in it. We've cooked food for each other and hung out at night, it was cool. * I have an Ultimate frisbee. Who wants it? * I terrified people with Twinkes and Sno-balls. * Dario Andres of bug triage fame is here. He's one of my roommates. :) Tell him hi. * KDE group photo tonight after awards, I'm being told. * Did I mention I've met interesting people? One way to guarentee this is to offer to trade something with them, it turns out. Do I owe somebody lemon-honey-almonds? Do you need sunscreen? Currently I send identi.ca-->twitter, and I usually microblog via SMS-->twitter. So I got a temporary Spanish phone... Except, twitter won't send to Europe atm. And I still can't SMS-->identi.ca. This all leaves something to be desired. Especially as it might be nice to tell you what I'm doing in Gran Canaria atm. And yes, I did eventually make it there, after much airport badness. Note: you cannot make it from one side of the Madrid airport to the other (which is practically in another city, you take a bus to it), and through customs and immigrations, and the slow luggage handlers in half an hour. We'll have some kind of DrKonqi development session/meeting/pool-gathering at Gran Canaria. Also, there's a BugSquad Bof, and you should feel free to come and complain or laud. Or just join. Oh, there's a lightning talk on it too. I put a little * next to all the new people. Check out how many that was! Very dedicated too, most came back later in the weekend. Thanks everyone! Thanks also to old-timers on the list, and to Pino, who helped run/train. Axes? Attacking people on pedestrian bridges and trying to throw them off? "Allah - you are the creator of all and all must return to you - Allah Akbar -"
If you haven't watched any of the youtube videos, find one of people calling Allah-u-Akbar from the rooftops. Hopefully things turn out ok, and people we know are ok.
We'll also have some kind of development/planning session/sprint/igloo for DrKonqi, so keep an eye out for that. I've been compulsively reading stuff about the Iran elections and protests. I hope people we know there are ok. In case you've been under a rock, feature freeze is Monday (the end of or UTC?) and string freeze is the day after. Also, you may have noticed that the new drkonqi is in trunk now. There are a few screens and scenarios that will make usability cry... We are working on them! Code is probably changing as you read this! Although it might be a bad to less bad thing... If you happen to be more of a specialist than me (and I'm not), and have run through these a few times, drop by #kde-bugs and let's talk. Suggestions are welcome for strings too, but you should wait for me to checkin stuff. 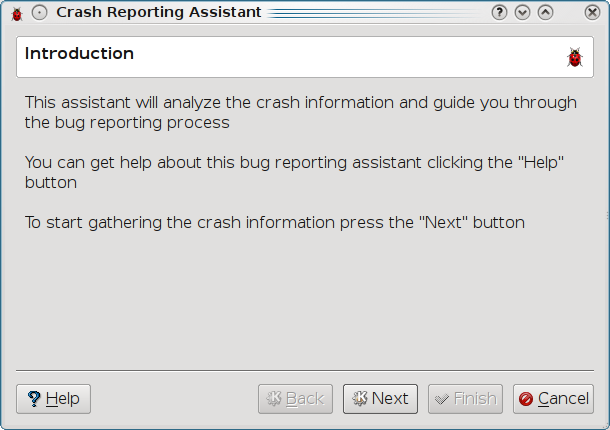 If you don't have debug symbols installed, only have part, or if you don't have the Qt ones installed, this is a case you can actually help BugSquad! 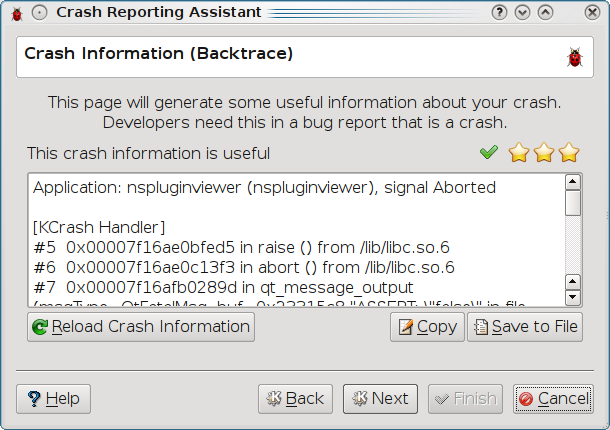 :D See what you think of the auto-backtrace analysis and how many stars you get for various real-world crashes. All thanks should go to Dario Andres and George Kiagiadakis, cause they rock for doing this! p.s. 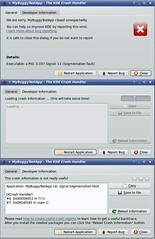 After freeze look for some improved how-to-build kde documentation and lots of BugDays. So I seem to have been put on the conference circuit recently. This has been pretty interesting, as they've all been slightly different in terms of organizing and what I've learned. :) This one was different because almost all of us were giving talks. Next day, armed with some candy and a flat of Pepsi from Costco, we hit the floor. There were a few companies, the usual non-profits/distros/LUGs, and some interesting local groups, including a room of robots for kids. As usual, our booth was really busy. All too quickly, afternoon started, and so did our talks. Bang bang back-to-back: myself, Jeff, Chani. At the booth, there were tons of newbies to Linux and some people who had run kde3, so I was surprised to find that a large portion of people at my talk were reasonably familiar with KDE4. I had projector problems, so I talked sans slides at first. Des had it fixed around when the presentation needed them, though, so that was good. Everyone else's talks went pretty smoothly, yay! By the time the talks were over, so was the day. So off to the afterparty! Which I was tired enough for, that I don't remember much. Except for the person playing around with a laptop which was inexplicably hooked up to a projector. And trying to use KDE with compiz. And crashing. Hordes of KDE developers descended. :) And I talked to the opensuse guy, "Zonker", and a bunch of others. At some point we headed back to the hotel and played poker with fake sugar packets. And I met all kinds of cool people. I later found out that I'd been talking to Randal Schwartz. Oh! Sunday, we were asked to give an encore talk. Your wish is our command! Des gave a talk on how to install a KDE developer environment using mypne's software. Look for slides and some cleaned up http://techbase.kde.org pages on the topic in the near future. (Newbies: irc.freenode.net #kde-devel can help you. User questions to #kde :) We then had some frantic fun figuring out shipping and packing, so we ended up leaving late. (This is at a school, so they can't do the usual type of shipping.) We did catch our plane though! Photos of KDE on your "mobile" device? Do you have one? Not just a screenshot, but something that clearly shows "this is a phone-type-thing". I'd like something I can use for a slide in a talk. Yay BugSquad birthday! We're one year old today! We have 8 people who have signed in. So happy birthday us! We're still going on for Sunday, so drop by.And have some virtual cake. You may have noticed a "Dario Andres" at the top of the bug-closer list for the last... well, a while now. I think he got tired of all the useless plasma backtraces, because he and George Kiagiadakis have been cooking up a rewrite of the crash dialog you get everytime something goes *boom*. We'll skip the "advanced" tab and pretend to be a newbie here. Note the "note:", if this box terrifies them, we want to let them know that they can close it and not worry that their system will be attacked by gremlins. I'm not sure that I'm happy with the X icon, but... You can directly restart your app from here, which is nice. Is this screen superfluous? If so, how do you combine it with the next? Here we get to the first of the logic bits. The stars show how good a backtrace is. If it isn't, then we want to send them off to get debug symbols if they want to, and then come back and hit that reload button. No screenshot of that atm, but it exists. EDIT: I'm compiled with full debug, so yes, I hit full stars. If I weren't, then I get other options. Here we hit UI/string issues. What is the shortest, easiest way to explain this? Also, note those checkboxes. Now I didn't check any boxes in the above. 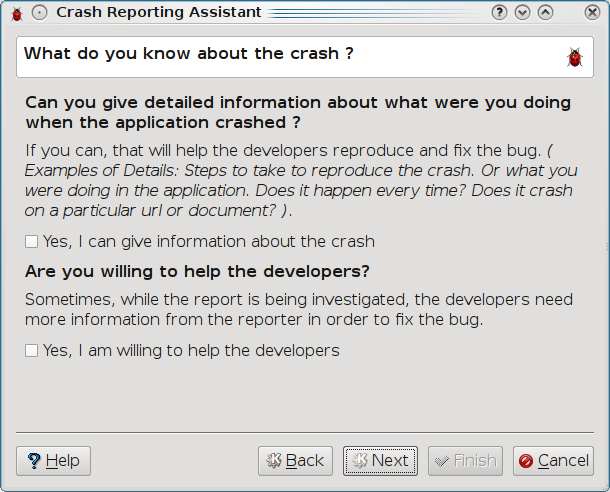 Since I'm not willing to help developers, I get an automatic "this crash isn't worth reporting". But here you see more logic going in for an attempt to tell users if their report might be useful. Does this seem clear to you? It goes on, but you get the idea. And I'm not posting all possible combinations to hit various screens. ;) Check it out and see what you think. This is actually a test blog post, I'm not syndicating it. But this is one mockup Dario came up with. Saturday was the first day of booths. As you can see once I link in my to-be-uploaded pic, we had a pretty impressive looking booth. It was really neat to meet more people who are in California! We were deluged even before the floor officially opened: other exhibitors came over. And from there it was almost non-stop talking to people and demoing KDE. The interesting thing is that people seemed to be either total newbies to Linux, or they knew a fair amount about KDE. There didn't seem to be much in the way of middle ground --- it was a very informed crowd. And very supportive too. Gamaral started doing live feeds from his camera (http://qik.com/video/1088813 ? ), and Aaron Johnson went to give his talk, and I stayed in the booth. After the floor finally closed, we met up with Dilip, one of the Redwood City Qt guys. Where he promptly won a case of Cocaine for us (OK, it's a soft drink!). We socialized some more and all crashed. SCALE: day 1, the "chick track"
Friday started off the Southern California Linux Expo. I've never been, so seeing the difference between it and LinuxWorld has been really interesting. The first day was just talks. I went to the "chick track", thinking I'd just go to one or two of the talks, but they turned out to be much more interesting than I thought they'd be. Although... Possibly not for the reasons they wanted them to be. The track was sort of a confused mixture of "things related to women" and "things related to newbies", which has the unfortunate implicit assumption that women = newbies. At any rate, I learned things that newbies expect. Most strikingly, that they expect to find answers in forums in a sticky at the top. Now we have http://forums.kde.org recently set up. But do they have the content they need? (*) Ontario Linux Fest at http://onlinux.ca is looking for one. l33t with line noise^w Perl? Maybe I should worry about zombie invasion instead. But I can actually fix a) and maybe write some documentation in the process. In the category of things I can't do and would make my life easier: not memorizing backtraces. If so, email mattr AT kde.org or you might be able to find him active on irc as mattr. Active is the key phrase here, he's got a small child to protect from the zombies. KDE Release Party in San Francisco Reminder & PHOTOS!